Information Security Blog Information Security Has the Notorious Carbanak Cybercrime Spree Reached its Finale? What You Need to Know About Stopping the Next APT Attack. Has the Notorious Carbanak Cybercrime Spree Reached its Finale? What You Need to Know About Stopping the Next APT Attack. In March 2018, the infamous and mysterious Carbanak mastermind was finally caught. The still unnamed leader of the Carbanak hacker gang (who some claim stole over $1 billion) accused of targeting banks, ATMs, and point-of-sale systems around the world was apprehended in Spain, according to the European Union Agency for Law Enforcement Cooperation (Europol). According to Europol, since 2013 the Carbanak gang had been using a series of advanced persistent threat (APT) malware attacks originally called Carbanak (also referred to as FIN7, Anunak, and Carbon Spider), targeting financial institutions. It’s alleged that during Carbanak’s multiphased attack spanning five years, it distributed malware using phishing emails with malicious attachments that caused ATMs to release cash at set times for money mules to pick up, and even transferred money into the gang’s bank accounts. While the true extent of the Carbanak cybercrime spree is controversial—the FBI and U.S. Secret Service issued a joint statement saying that they have not received a single report that Carbanak malware affected the U.S. financial sector (countering the claims made by some cybersecurity companies)—understanding and preparing for all the possible permutations of an APT attack is critical. Advanced persistent threats are continuous, stealthy, and orchestrated by those targeting a specific entity. The motives can be political such as the ViperRAT APT group that targeted the Israeli Defense Force by spying on their military and hacking into the personal Android mobile devices of Israeli soldiers. Or, they can target retail using sophisticated strategies such as in the Neiman Marcus attack where 60,000 security alerts were missed as hackers stole credit card information during a protracted eight-month crime spree in 2014. Card-stealing software was automatically deleted from the point-of-sale payment register system at the end of each day, triggering hundreds of alerts that looked like false positives and went unheeded by the security teams. One feature is clear, APTs’ multistep, covert, and persistent attacks can unfold over a long period of time, such as in the PF Chang’s security breach when data was stolen from 33 restaurant locations over eight months. And APTs feature a human-run command and control system that continuously monitors and extracts sensitive data from their victims such as in the Carbanak case. Figure 1 – These steps show how APT attacks are executed from the intelligence gathering stage to data exfiltration. As we’ve seen, APT attacks typically involve the use of stolen credentials, access to administrative assets, lateral movements, and organizational data exfiltration. Lateral movement is a method attackers use to move through a network by using IP addresses, credentials, and machines in search of key assets and data. Modern SIEM solutions track suspected activities like changes to devices, IP addresses, or credentials. Using SIEM tools with behavior analytics can detect APT attacks because they’re able to track user behaviors more effectively, enrich the data with contextual information, track lateral movements, and detect data exfiltration. Below are the approaches used by next-gen SEIMs to identify an APT attack. Identifying and tracking normal user behavior is key, so that anomalous behaviors and deviations can be identified. Advanced analytic tools can baseline user behavior for a period of time and establish a trigger for any deviations from the normal. 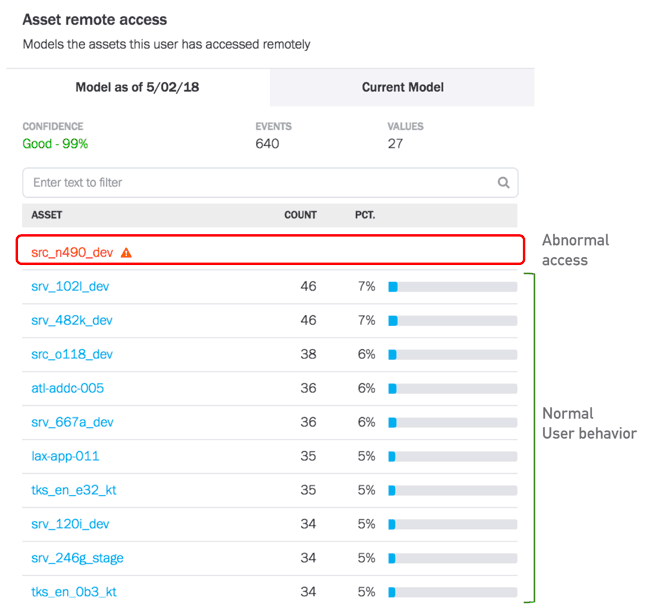 Figures 3 and 4 show abnormal access of an asset and an abnormal data upload by a user. Figure 2 – This model shows normal and abnormal access of an asset by a user. Figure 3 – This model shows abnormal data upload by a user.When security events are enriched by contextual data and user behavior is baselined, it becomes easier to track abnormalities. Any deviations from the user baseline are tracked and given a risk score. All these activities are tied together in a continuous timeline, and risk scores are aggregated to detect threats. Figure 4 – This shows the tracking of a user session and shows risky behaviors with explanations for the behaviors.Models for remote logins, privileged account switches, database activities, and administrative asset logins are all used to track normal user behavior, and any deviations such as lateral movements will cause a trigger. Figure 5 – A user timeline and model showing a switch to a privileged account.As we can see, APT attack strategies have a high level of sophistication that will likely evolve over time. With increasingly dynamic environments enabled by trends like bring your own technology (BYOT), more data in the cloud, and growing numbers of point-of-sale payment systems, APTs will have more points of entry to unleash their havoc. Modern next-gen SIEMs are engineered to detect abnormalities quickly—before APTs can do major damage to an organization, which could take years to discover and stop.